Ipswich Town's three-match losing streak came to an end with victory at 10-man Huddersfield Town. Ben Pringle, on loan from Fulham, took advantage of hesitant defending by Joel Lynch to give Town a first-half lead. It was Ipswich's only chance before the break as Kyle Dempsey, Nahki Wells and Harry Bunn went close for Huddersfield. Ipswich protected their lead in a more even second half before Jonathan Hogg went off injured after Huddersfield had used all their substitutes. 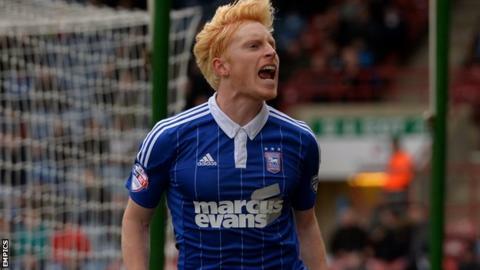 The win boosted Ipswich's hopes of getting back in to the play-off places as they rose to ninth in the Championship. Mick McCarthy's men are four points off Sheffield Wednesday, who are in the final play-off place, but Ipswich have a vastly inferior goal difference. Huddersfield remain in 16th place, but Rotherham's win at Brentford means the gap between the Terriers and the relegation places in now 10 points. "There were incidents that did not go our way. One of them was a fair play moment for Nahki Wells. If Nahki gets a bigger hit then it's clearer and he gets a penalty. But I want fair play from my players. "If we win games I want it to be by fair play but if we get a penalty the result could be different. "The first half was fantastic and it hurts that we got this result for our performance. "The possession and shots tell you everything about this game. Usually you would get the result. Maybe I will feel better about it in the morning." "This was a huge result for us. We needed a win and, as usual, my lads have come up trumps when we needed them. "For all the chances Huddersfield had they didn't take any and we were clinical. We rode our luck but everybody needs luck. "The other night I was down, upset and angry and, to be honest, I'm sick of talking about the play-offs. If we get in there, brilliant, if not there's not a damn thing I can do about it. "If we had come away from Huddersfield having lost four on the bounce I can't imagine how I would have felt." Match ends, Huddersfield Town 0, Ipswich Town 1. Second Half ends, Huddersfield Town 0, Ipswich Town 1. Ainsley Maitland-Niles (Ipswich Town) wins a free kick in the attacking half. Substitution, Ipswich Town. Paul Digby replaces Freddie Sears. Ainsley Maitland-Niles (Ipswich Town) is shown the yellow card for a bad foul. Attempt blocked. Harry Bunn (Huddersfield Town) right footed shot from outside the box is blocked. Corner, Huddersfield Town. Conceded by Jonas Knudsen. Hand ball by Brett Pitman (Ipswich Town). Substitution, Ipswich Town. Ainsley Maitland-Niles replaces Kevin Foley. Jonathan Hogg went off injured after Huddersfield Town had used all subs. Attempt blocked. Freddie Sears (Ipswich Town) left footed shot from outside the box is blocked. Assisted by Brett Pitman. Attempt saved. Jonathan Hogg (Huddersfield Town) right footed shot from outside the box is saved in the bottom right corner. Assisted by Nahki Wells with a headed pass. Attempt missed. Elvis Manu (Huddersfield Town) right footed shot from outside the box misses to the right. Assisted by Jonathan Hogg. Offside, Huddersfield Town. Elvis Manu tries a through ball, but Tommy Smith is caught offside. Attempt saved. Jamie Paterson (Huddersfield Town) right footed shot from outside the box is saved in the bottom right corner. Assisted by Elvis Manu. Elvis Manu (Huddersfield Town) wins a free kick in the attacking half. Attempt blocked. Christophe Berra (Ipswich Town) right footed shot from outside the box is blocked. Assisted by Daryl Murphy. Substitution, Huddersfield Town. Elvis Manu replaces Kyle Dempsey. Hand ball by Jonathan Hogg (Huddersfield Town). Attempt missed. Daryl Murphy (Ipswich Town) left footed shot from the left side of the box misses to the right. Assisted by Freddie Sears. Jamie Paterson (Huddersfield Town) wins a free kick in the defensive half.